Happy Monday! I'm still stick in holiday mode and lounging around the house, but hopefully the day goes well for those of you that have returned to work! 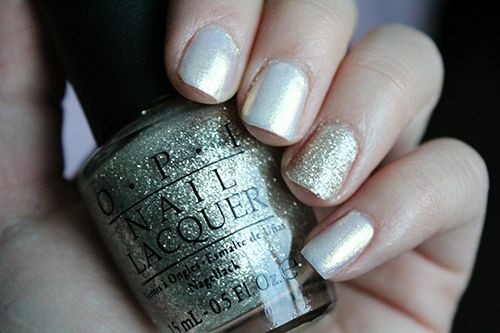 It's the last Monday before we ring in the new year, and I've got a pretty polish to share with you today. As you may remember, I've been swatching my way through the CND Vinylux Forbidden Mini Collection. 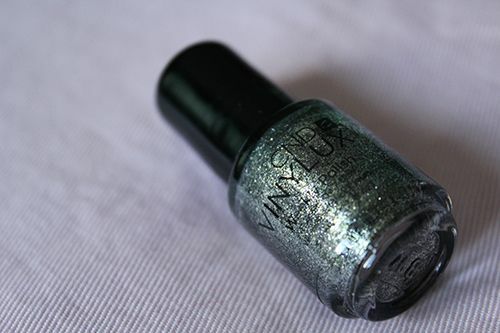 Night Glimmer can be described as a green-brown shade with silver glitter. It's pretty complex and flashes a different colour with changing angles, and I loved looking at the colour throughout the week of wear. The formula is smooth and opaque with three thin coats, drying quickly with the application of the weekly top coat. Although the collection promises a full week of wear chip free, my wear tests have proven otherwise for the creme shades. However, this particular shade has proven to wear very well! After six full days of wear there is minimal wear at the tips and only a small chunk of polish missing from my pinky. 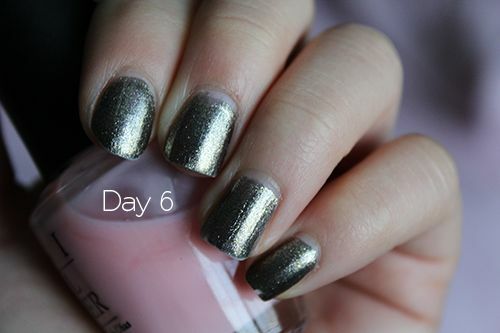 I think this just goes to show that glitter shades do indeed wear longer, even with regular nail polish. What I found the most surprising with this formula is how easy to really was to remove it. Just a little acetone and some patience and it comes right off the nail. 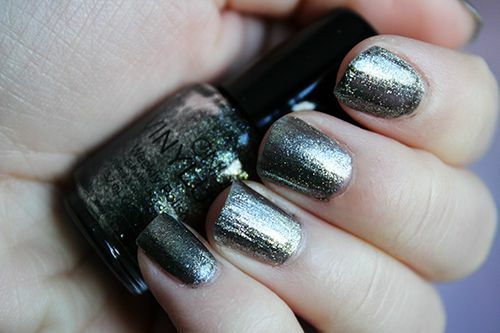 There's no need for foil removal or concentrated scrubbing like regular glitter polishes. If you're looking for a week-long polish, I would definitely suggest this shade or any of the glitter polishes in the CND Vinylux range! Happy Monday! There's two days 'til Christmas and I couldn't be any more excited. I've been spending my days in the kitchen baking up a storm and wrapping presents to place underneath the tree. This year for Christmas I've got a frosty and glittery manicure to wear for the holidays. 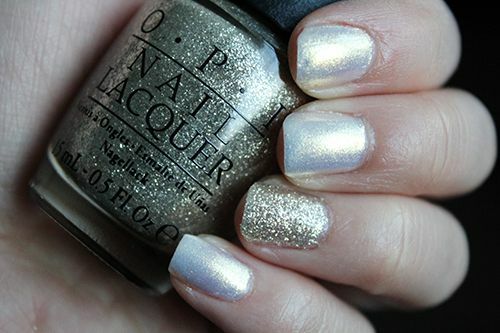 Ski Slope Sweetie & My Favorite Ornament are both from OPI's 2013 Mariah Carey holiday collection and look great combined with each other. There's just something about the need for all things sparkly during the holidays. Both formulas are self levelling and easy to apply, reaching full opacity in three thin coats. I hope everyone has a wonderful Christmas - whether you celebrate it or not. Take the time to rest, relax, and catch up with family. I can't express how thankful I really am for each and every one of you that read my blog, but thank you from the bottom of my heart for supporting me every step of the way. Wishing you all a joyous and safe holiday season! 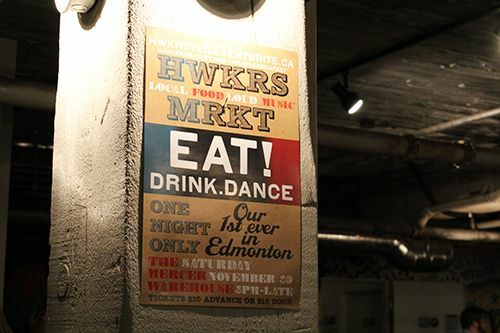 Last month, the first ever Edmonton Hawkers Market was hosted in the Mercer Warehouse. 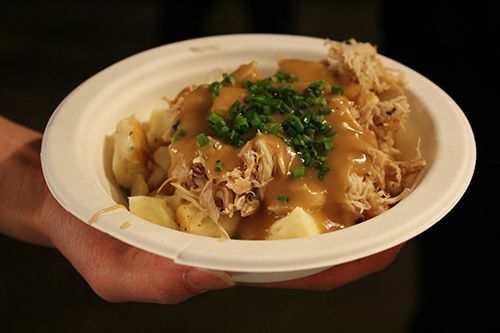 Chris Jerome, the founder of Hawkers Market in Vancouver, decided to bring the concept to Edmonton to celebrate local food vendors and provide and opportunity for local businesses to grow. It was a great evening of food, dancing, and fun. I only wish that there were more vendors on site selling product to take home, rather than food to eat then and there. Maybe changes will be seen in the next market? It's already scheduled for February 22, 2014 - get your tickets now if you're interested! It's been a busy couple weeks with school, work and the holiday season, but I had a chance to sneak out for lunch last week and catch up with an old friend. 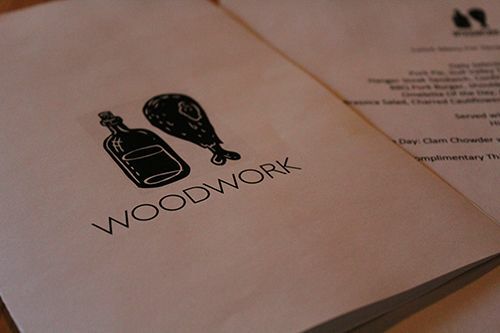 I had been anticipating the opening of Woodwork for the longest time, so when they announced their first lunch service I had to get myself there. 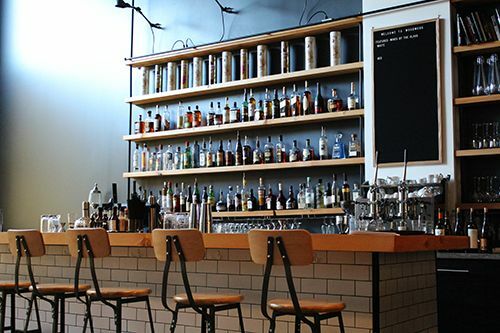 Woodwork is the joint venture between the people behind Nomad and The Volstead Act. As a team the restaurant is working towards sustainability and is commmitted to making as much as possible in house. Their cuisine is described as Southern BBQ with French influences, which is pretty unique in itself. Natural light peeks into the dimly lit restaurant furnished with modern decor. At one end of the restaurant an array of bottles lines the shelves at the bar and is completed with a ladder to reach the higher shelves. 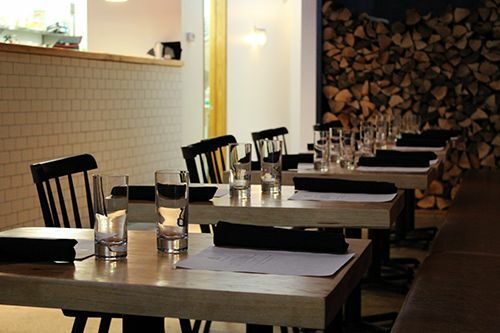 At the other end, diners can catch a glimpse of the kitchen and the endless supply of wood blocks for wood-fired cooking. I'm not going to lie, it's got a bit of a hipster vibe going on. The Volstead Act specialized in cocktails, so I'm sure there's plenty of offerings on the menu that can pique your interest. But for lunch we chose to order some of the house-made sodas. 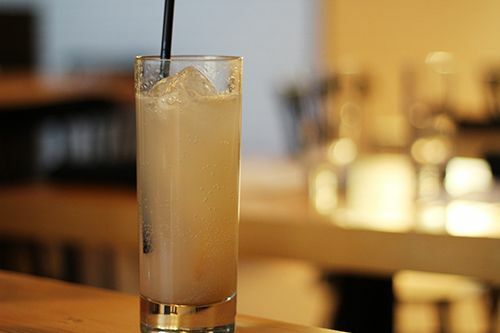 I ordered myself the Black Walnut Lemonade ($4) made with orgeat, lemon & black walnut bitters, while my friend went for the Celery Soda ($4), both of which were light and refreshing. 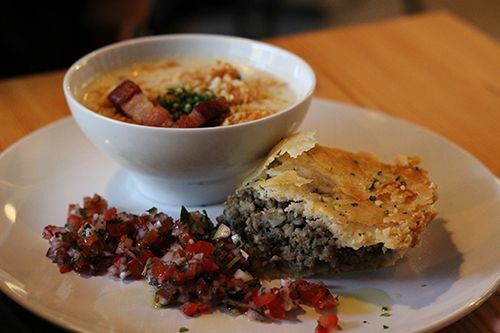 First up to our table was the Pork Pie with Gull Valley Tomato Chow Chow and a side of Clam Chowder with house made bacon & cheddar biscuit croutons ($15). The pork was nicely seasoned and wrapped up in flaky layers of pie crust. The chow chow (a form of relish) also added some crunch and refreshing flavour. Out of all the items on the plate though, the soup is what I enjoyed the most. The chowder was chunky, packed full of vegetables and wasn't too thick in consistency. The smoky notes from the bacon gave it some extra flavour, making it comfort food at its finest on a cold day. I would happily sit and have bowl after bowl of this chowder. 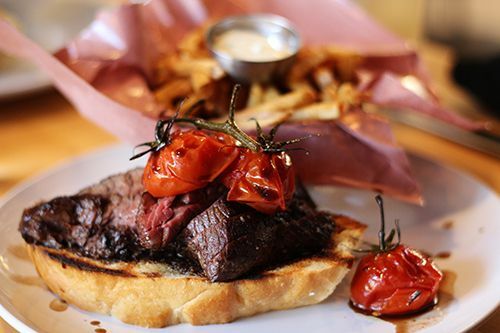 For myself, I ordered the Hangar Steak Sandwich with Confit Tomato & Red Wine Reduction with side of Hickory Frites ($15). Presentation of the dish was beautiful and it tasted just as good (if not better) as it looked! Tender, juicy steak cooked medium rare, sliced and presented as an open faced sandwich with a slightly tangy reduction was the perfect lunch for me. The bread was incredibly soft with a crunchy crust, and the tomatoes sliced open were sweet and juicy. The light tarragon aoili served with the fries on the side was delicious as well. 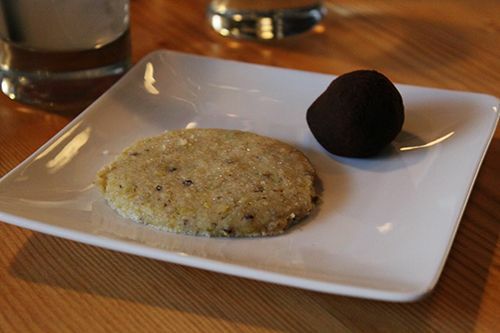 To finish our lunch, we were served with their complimentary dessert for the day: Pistachio Shortbread & a Smoked Chocolate Truffle. The shortbread was crumbly, soft and studded with pistachios. 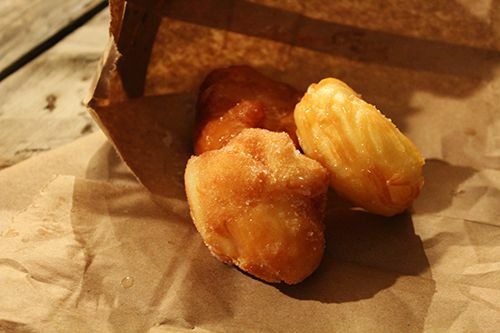 It wasn't too sweet and had a slight saltiness which I really enjoyed. The smoked truffle on the other hand was decadent. Smooth and rich with an ever so slight smoky flavour, it was a decadent way to end the meal. 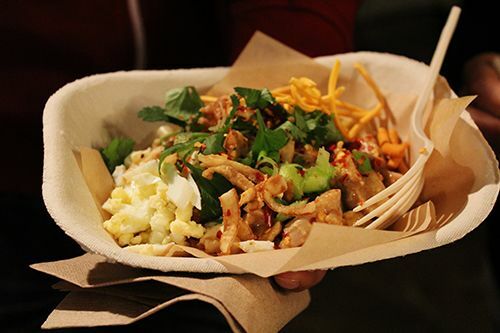 With a commitment to local, sustainable ingredients, the menu changes every few days. I am loving the fact that Woodwork is posting their updated menu on their website (here), so that diners are able to peruse the daily offerings before heading into the restaurant. 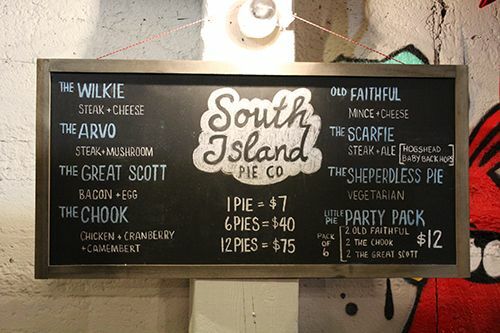 For lunch, all the selections are $15 and include a small complimentary dessert at the end. Great deal if you ask me! The service is friendly and the food is delicious - what are you waiting for? Check them out when you have the chance. 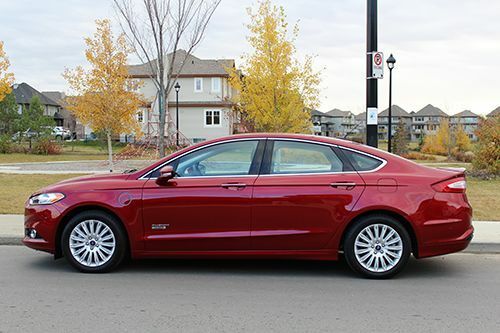 Back in October I was given the opportunity to check out the 2013 Ford Fusion Energi. After driving the C-Max Hybrid in the early spring, the idea of trying another eco-friendly vehicle definitely piqued my interest. What differentiated this experience from the C-Max was that the Fusion Energi is a plug-in hybrid vehicle. When I arrived at the dealership I immediately thought to myself that a) it was a pretty streamlined looking vehicle and b) I liked the colour. Ford did a great job designing the exterior! Sitting in the driver's seat it was evident that I was sitting in a vehicle much wider than my trusty little Civic, but I had no problems navigating or parking in the city. The cabin is spacious, giving little me plenty of space to move around and adjust the seat. The Fusion Energi that I drove was outfitted with power-adjustable leather seats and a dash made of soft plastic material with silver trim. 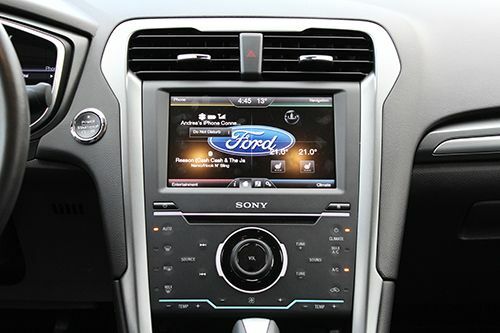 The MyFord Touch system was placed in the center of the console ,the same as with the previous vehicles I have driven, so I was already familiar with the touch-screen technology. What was different was the flat panel of 'buttons' beneath the touch screen to control climate and audio. And I say "buttons" in quotation marks because I don't think they were true pushable buttons, but rather heat-sensitive buttons. The gear selector was quite close to said panel of buttons and it was a little irritating to accidentally swipe across the panel, activating a bunch of different functions. Technology aside, I loved driving the Fusion Energi around the city. This particular vehicle was armed with lots of driver assistance, including the active park assist (which is SO perfect for parallel parking! ), front, rear, and side collision warning sensors, a back up camera, blind spot monitoring, and lane control technology (which tells you when you're veering out of your lane on the road!). When running in electric mode the interior of the car was dead silent, so much so that I could easily tell when I started to drive using gas. Another thing I noticed is that the car was able to accelerate surprisingly fast. I never really noticed it until I looked at the speedometer to see just how quickly I was going. I'm a total speed demon on the road and this vehicle was able to keep up with me! 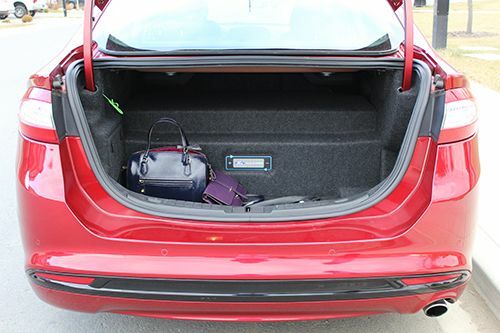 The biggest issue I could think of having with the Fusion Energi had to do with the trunk. As you can see, there's a gigantic battery taking up a majority of the space, leaving little room to carry things in. For someone like myself it's not really a big problem because I can fit groceries and my bags or shopping purchases in there. But big purchases like space-loving electronics (think TVs) or picking up relatives from the airport would be difficult for sure. 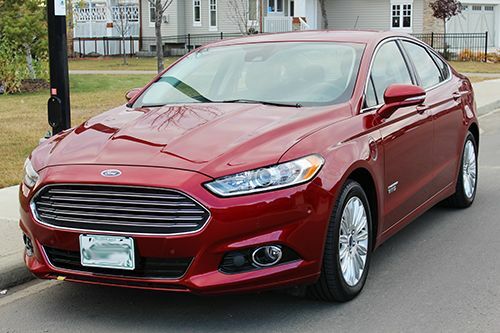 I had a great time driving the Fusion Energi throughout the week and must admit I was a little sad to let it go. The ride was steady, and in one week of driving I used less than one quarter of a tank of gas, having charged it only 3 times. Within the city limits I had a fuel economy of 5.1 L/100 km, which is pretty great compared to Ford's listed value of 4.5 L/100 km. Theoretically, the Fusion should be able to travel up to a distance of 33 km on electric power alone, but I typically only achieved 27 km after a full charge. Now this brings to mind what the cost would be to charge this vehicle day in & day out. For the battery to fully charge overnight it takes about 7 hours in a regular electric outlet. 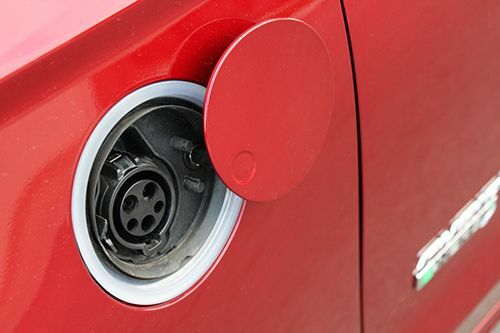 After doing some research, the cost for a full charge is about $1-$2 CAD, which can equate to a fair amount of savings over time if your regular commute isn't far or if gas is expensive. Like the C-Max, the Fusion Energi features a Brake Coach on the dashboard, teaching you how to brake efficiently in order to maximize the regenerative capacity of the brakes to increase fuel economy and reduce wear on the brake pads. Brake better and you extend the use of the electric mode. Including all the features in this vehicle the price came out to just under $48 000, but the basic model starts at $42 000. It's a pretty heavy price tag, but it does depend on your commitment to the environment. In the long run, you will likely see the savings in fuel expenditure as well. By buying hybrid vehicles from Ford you also support their initiative to use sustainable materials in their vehicles. In continued commitment to reduce the impacts of vehicle production on the environment, the interior of the fusion is comprised of many recycled materials. At the current price tag, the Fusion Energi is way too expensive for a student like myself, but hopefully down the road hybrid vehicles will be more commonplace and affordable. I can only hope so, for the sake of the environment. Happy Monday! Hope you've all had a wonderful weekend, especially my fellow Edmontonians braving the cold weather with me! I've got a big announcement today, but you'll have to get all the way to the bottom of this post to find out. See you there! A few months ago I received the entire range of products from the Amazon White Clay line made by Taya. Taya, which means "I Am" in the Wayuu dialect, is a beauty brand specializing in hair care products. While I'm not typically too picky about my hair products, what appealed to me about Taya is their commitment to being sustainable and environmentally responsible. What that means is that their products are sulfate, paraben & animal product free, and they don't use any animal testing. In the Amazon White Clay Thickening collection all the products include organic ingredients found in the Amazon Rainforest. So before I can dive into a review, let's talk hair. Everyone has different hair characteristics and care regimens, so this review is based on what I've experienced and how I use the products. I have medium-thick hair with roots that like to become greasy and ends that are dry and prone to splitting (I also blame our weather...). 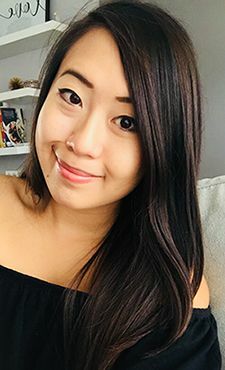 I wash my hair every other day, blow drying only when necessary, and my hair has been chemically straightened every 2 years for the past 5 years. When I use a hair dryer I try to remember to use heat protectant spray and seal in my ends with Moroccan Oil. So as you can see I try my best to keep my hair happy, but I'm not the most diligent with protecting it either. Taya's Amazon White Clay collection aims to thicken hair, and has a total of 8 products which I've been testing out for the past two months. Amazon white clay, Croton Lechleri resin, and raw avocado oil are the main ingredients working together to add body and shine to hair, making it feel richer and volumized. On a side note, the entire range of products has a natural, clean scent to it. After I used the products for the first time, my boyfriend took notice and commented on my hair smelling great. Thanks Taya! Amazon White Clay Thickening Shampoo ($20) - the formula of this shampoo is different from your typical runny shampoo. This shampoo is quite thick, as if there is a lower water content, giving it a gel-like consistency. You need a fair amount to build up a lather in your hair. After rinsing, your hair feels really clean without being stripped of its natural oils. Amazon White Clay Thickening Conditioner ($22) - a little goes a long way with this creamy formula. I apply it to the ends of my hair, and I can immediately tell the difference after rinsing as my hair feels incredibly smooth. After drying, my hair is soft and the ends feel like they've retained a lot of moisture. Amazon White Clay Thickening Creme ($22) - on days when the weather was drier I would apply a small amount to the ends of my hair before blowdrying. This allowed for my hair to stay frizz-free and straight. Surprisingly enough, the product was lightweight and didn't weigh my hair down. It's a great product to use and my dry ends look healthier after application. Amazon White Clay Thickening Leave-In Mist ($22) - like other leave-in treatments I either spray this into the ends of my hair before or after drying. It leaves hair soft by nourishing each strand and gives it a fresh scent. Amazon White Clay Hair Spray ($24) - a medium hold hairspray with a pump nozzle. I'm not the biggest fan of hairsprays that dispense in this way, as I have a lot of difficulty controlling where it goes and my fingers always feel so weak! The formula works great for keeping flyaways and baby hairs in place, but it doesn't do much for curls. It is lightweight and allows hair to remain flexible but it's not a product I would consistently reach for. Amazon White Clay Thickening Whipped Clay ($24) - similar to a mousse, this whipped clay is great for creating texturized hair styles. Applied at the roots and blow dried it gives hair volume, but I also find it feels heavier and makes my scalp oilier than usual. Using it at the ends of hair for curls and scrunching is great, but again it does make hair feel heavier and gives it a bit of sticky texture. Amazon White Clay Thickening Hair Spray ($24) - now this is the hairspray that I like. Aerosol, easy to control, and strong hold. It works great to hold any style in hair, and it doesn't leave hair feeling hard and clumped together. It does have a bit of a different scent to it though since it is an aerosol formula. Amazon White Clay & Acacia Collagen Hair Plumper ($24) - at first I had no idea what this product was for, but it's come to be my favourite one in the entire line. It's a mousse & hairspray all-in-one, which I apply to my roots before blow drying. I instantly get volume once the area is dried and my hair doesn't feel like there's any product in it, leaving my hair feeling light and lifted all at once. After two months of use I can confidently say that my hair does indeed feel fuller, but it's not a dramatically noticeable difference. Holding my hair in my hands it feels thicker to a certain extent, as if I have more hair, and it's much easier to work with. I would say the Amazon White Clay line by Taya is great for people with fine hair, or for anyone that's looking to get more body and volume without weighing their hair down. But even if you don't want the volume, an added bonus is that many of the ingredients are hydrating for your hair, keeping it in good shape. Now here's the big announcement: What better way to celebrate the holidays and ring in the new year than with a giveaway? So I've teamed up with Taya to bring you my biggest giveaway yet, the entire range of products from the Amazon White Clay line. That's a $180+ value in products! So let's make it a new year's resolution - you get the products and promise to pamper and take care of your hair! This giveaway is open internationally, as I want to thank ALL my readers for the continuous support! If I could I would gift this set to each and every one of you! To enter, follow the instructions in the widget below. Giveaway ends January 1st, 2014. 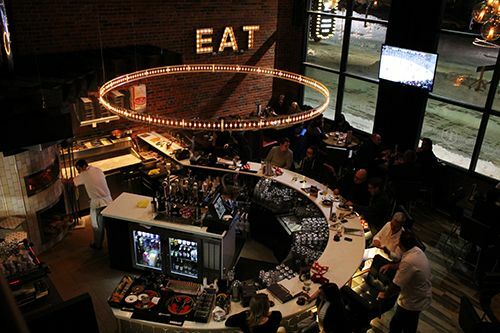 The Century Hospitality Group in Edmonton has added another restaurant under it's belt. This time it's an Italian establishment with wood-fired pizzas and freshly made pastas to boot. The Parlour is located just south of Grant MacEwan University on Capital Boulevard - an area that I'd love to see flourish with development in the next couple of years. Having been opened just over a week, I had to stop by to check the place out for myself, especially when Twyla gave them an outstanding review the morning of my visit. Walking into the restaurant got me really excited. Looking around and taking in the sights, the building had been beautifully renovated with brick and wooden accents. The high ceilings give it a sense of openness, while the dark decor and dimmer lighting still give it an intimate feel. We requested to be seated in the dining room and the hostess quickly brought us to our table. From where we were seated we had a birds-eye view of the restaurant, allowing us to see the bar and wood-burning oven. 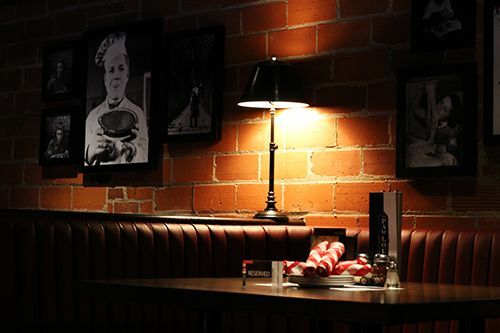 The menu at The Parlour was designed by Chef Paul Shufelt and Chef Tony Le, and both are celebrated chefs within the Century Hospitality Group. Flipping open the provided menus at the table, my eyes were bigger than my stomach (as usual) as there were a variety of dishes that I wanted to order. Many of the options made my mouth water, so I chose a few with some help of recommendations from our server. First up was the Arancini ($12), which is always a must-order for me when I see it on a menu. The Parlour's version is presented as five risotto balls with green peas, taleggio cheese, truffle oil, arugula & shaved parmesan cheese. The arancini were deep fried to golden perfection, and the flavours worked really well together with the addition of lemon juice. However, I felt that the risotto to cheese ratio was way too high, making each ball quite dense and not cheesy enough. 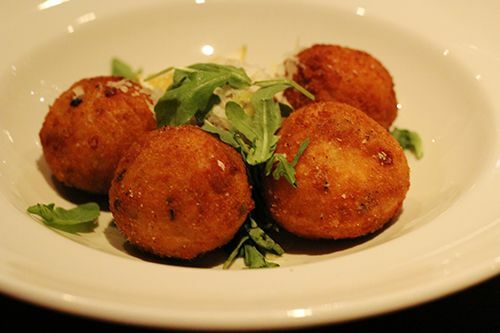 I like my arancini lighter and easier to break into, whereas these ones were tough and too starchy with each bite. 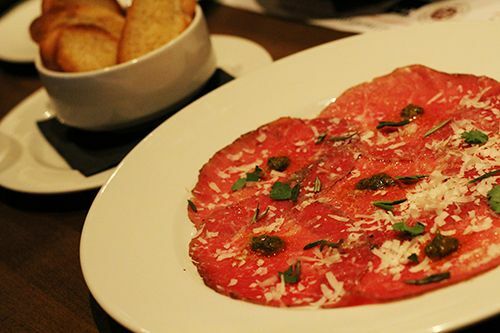 The next appetizer to the table was the Carpaccio ($16): Snake River Farms Wagyu beef, shaved parmigiano, sriracha pesto, warm toasted crostini. The shaved beef was presented beautifully, each with its own dollop of sriracha pesto. Placed on top of a soft, warm crostini, it was a perfect two bite appetizer with a punch of basil and kick of heat. Yum. For the evening we wanted to try out some of their signature pizzas, and first up was the Short Rib ($19): Braised Alberta Beef short rib, fire-roasted Serrano peppers, shaved pecorino, EVOO. Out of all the restaurants that feature a wood-fired oven, I have to say that The Parlour does the best job with their crust. It's thin and blistered when cooked, but holds its shape and doesn't fall apart when you lift it off the pan. There's nothing more frustrating for me than to grab a slice of pizza and have all my toppings slide right off. 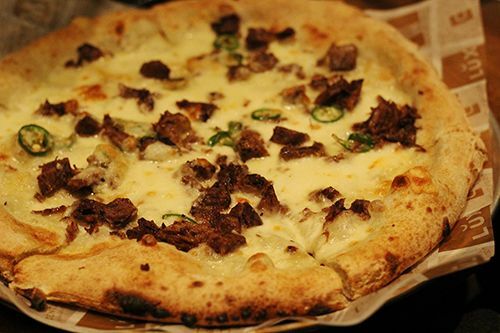 The short rib pizza was good - cheesy, with tender shaved short rib and a kick of heat. Given the price, I would have wanted a more substantial portion of meat on the pizza. 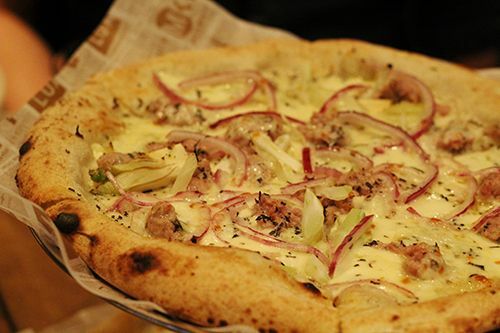 We also had The Wise Guy ($17) - Spicy Italian sausage, wood-roasted onion, fennel, provolone, fresh rosemary. The ingredients were much more abundant on this pizza, and like the other, the crust maintained its shape with each bite. Overall a pretty good pizza with nice earthy flavours. 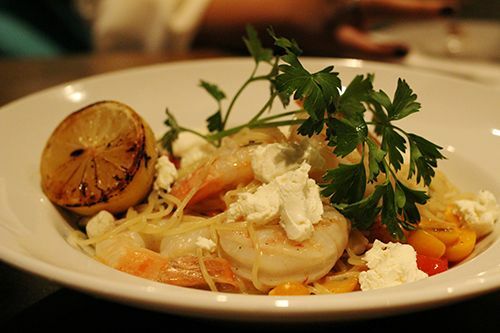 Our first pasta for the night was the dish I had been looking forward to the most, the Lemon Prawn Capellini ($23): Angel hair pasta, seared tiger prawns, cherry tomato, bruschetta, crumbled goat cheese, lemon broth, EVOO, fresh basil. As a lover of all things citrus, the description of this dish was music to my ears. However, the first bite sent my tastebuds on a rollercoaster ride. The pasta was borderline too sour and was very difficult to eat. I can honestly equate the flavour to shoving a handful of sour Skittles into my mouth - that initial shock of tangy sourness that sends chills down your spine is what this dish gave me. I had brought up the issue with the server and was told that the dish was meant to have the dominant lemon flavour, but I can assure you that something had to have gone wrong in the execution of the dish. Aside from being too tangy, the pasta was cooked al dente, and the prawns were large and juicy. The addition of goat cheese and sweet cherry tomatoes helped to tone down the flavours, but it was still difficult to eat. If the flavours were toned down this would be an amazing pasta dish. 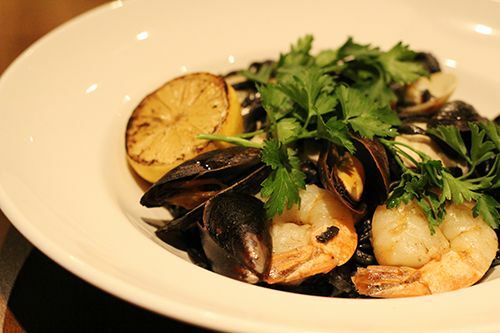 The other pasta we ordered was the Seafood Linguini ($26): Squid ink pasta, steamed mussels & clams, sautéed prawns, fresh herb oil, charred lemon, white wine. I had high hopes for this, as I love squid ink pasta, but this pasta dish also fell short. The seafood was fresh, but the pasta itself was overcooked, sticky, and falling apart. As a result, we were eating clumpy chunks of pasta with a hint of garlic flavour. The presentation of the dish was beautiful, but I wish the pasta tasted as good as it looked. According to the manager, all the pastas are freshly made in house, so this one needs a bit of work. Finishing off the night, we ordered two different desserts. 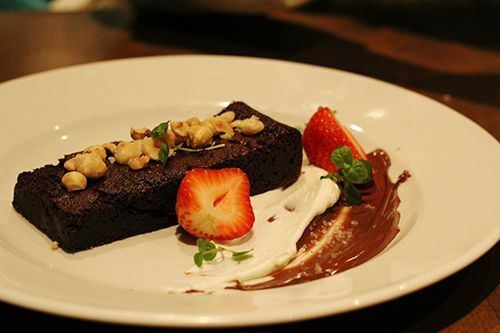 First up was the Chocolate Torta ($9): Candied hazelnuts, salted Nutella ganache, vanilla crema. To me, chocolate torta should be like a flourless cake with an almost pudding-like texture to it. The torta at The Parlour is more of a cake brownie, so it was a little dry and different from what I had expected. That being said, it was still a nice dessert, but far from my favourite chocolate torta at Corso 32 (which it resembles in presentation). 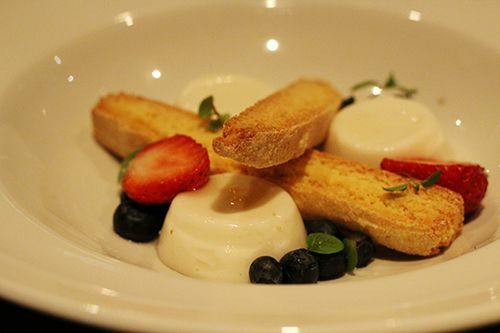 Last but not least, we had the Panna Cotta ($9): Vanilla bean, fireweed honey, fresh berries, homemade biscotti. The dessert had a lovely presentation, and we got three little portions of panna cotta on a plate. 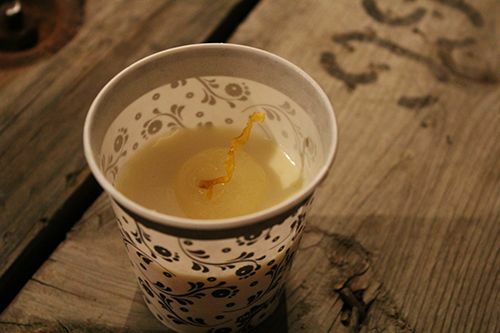 The panna cotta was creamy and the addition of honey gave the perfect hint of sweetness. It was stiffer than I am used to, but was a nice dessert to round off the meal. Having known that The Parlour had received a favourable review, I was actually quite disappointed when leaving the restaurant that evening. It is obvious that there are inconsistencies in the kitchen, but I don't really think its excusable when the Century Hospitality Group has a well established empire of restaurants in the city. The price point of the dishes doesn't exactly make this your everyday go-to restaurant (our meal was $40/person pre-tip), and you expect to have a great meal when you choose to pay higher prices for fresh food of good quality. Talking to some other patrons at the restaurant on the same evening, they had similar experiences and opinions about the food. That being said, I had the chance to express my concerns to a manager at the end of the meal, giving details of the ups and downs of the evening. He was quite receptive and appreciative of the feedback, which is what I like to see. On the upside? Our server was quirky and personable, making it a really fun evening. So give The Parlour some time, and let them work out the kinks before you check them out. I will be giving them another shot, 'cause I want that capellini the way it's supposed to be! Christmas shopping can be one of two things: fun or stressful. For me, Christmas shopping is typically fun. But when it comes to finding a gift for the one person that has everything, it can be so stressful! So I decided to put together a list of things that you might want to consider gifting this holiday season. 1. Wood Phone Case from Ten Tree Apparel - Ten Tree Apparel is a Canadian-based company that promotes sustainability and ensures that all their products are produced responsibly. For every item purchased, ten trees are planted in different areas around the world. How cool is that? 2. Zipper Back Pullover from Bianca Nygard - Nygard is one of the largest clothing manufacturers in the world. When I was young I remember my mother buying from their line, and I never took notice again until recently. The products are great quality and I love how fashion forward a lot of the items are. This sweater is definitely on my wishlist - it's cozy, the marled grey knit is so popular this season, and it's got the high low hem and zipper back to boot. Love it. 3. Golden Monogram Mug from Anthropologie - what's better than a personalized gift? 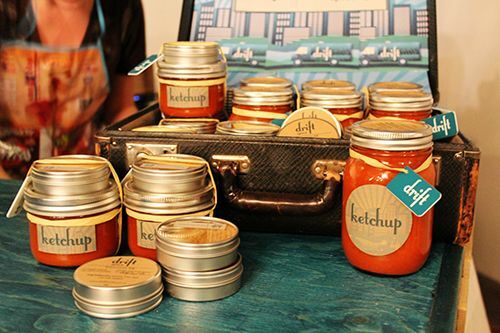 A personalized gift that is useful! I'm loving the gold monogrammed mugs from Anthropologie this season (along with a ton of other housewares). Check out their black & white version too! 4. Naked 3 Palette from Urban Decay - this season's most wanted eyeshadow palette belongs to Urban Decay. Gorgeous rose-toned hues lie inside the case, and it is a must have if you have Naked 1 and Naked 2 already. 5. Fur Lined Headband from Ardene - Ardene is a Canadian-based fashion forward company, bringing girls style at affordable prices. Staying warm in the winter months is a must in Edmonton. 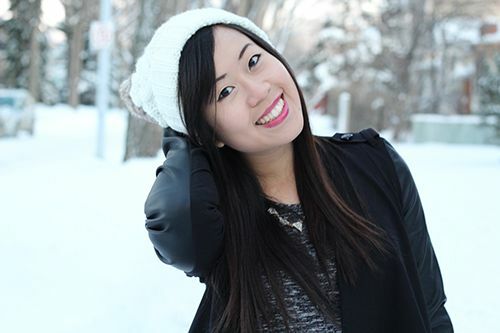 I always find I'm the warmest when I'm wearing a hat or earmuffs, and I'm loving this headband! Fur is a popular trend right now, and its downplayed by the grey knit. Plus, when you buy from Ardene you support their involvement with charities. I love companies that give back. 6. Side Plate by Invention-ware - How comical is this?? Can you imagine serving a dish to a guest, and have them finish only to find this message? Genius. I would be so anxious just seeing people's expressions!